Taylor's Landing boat ramp has small boat access. It is located off Taylors Landing Road and has 14 parking spaces. The river from here downstream to Shepherdstown--about five miles--can be canoed or kayaked if the river level is high enough. Check the Potomac River gage at Hancock, Maryland. River levels should be above 3 feet. Upstream of Taylor's Landing is also a nice flatwater area for about a mile. The next boat ramp downstream is at Snyders Landing. 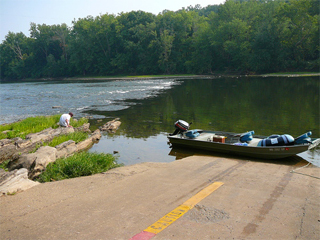 The nearest boat ramp upstream is at Big Slackwater on the Maryland side of the Potomac.